CPE802A is a WLAN card in half-mini PCIe type supporting PCI Express interface.This card supplies better wireless connectivity, higher speed, and extended distance for notebook platforms, embedded devices and high end gaming machines.With miniPCIe interface, It packs the Atheros Signal-Sustain Technology (SST) technology that enhances rate-over-range performance. Features are enabled by 802.11n including LDPC, TxBF and MLD. 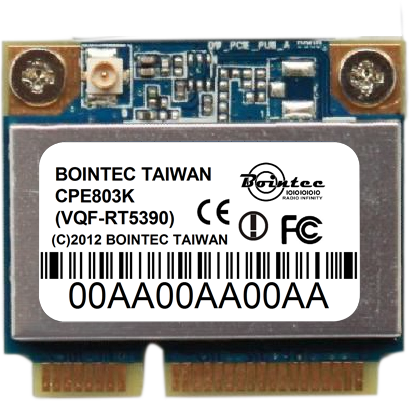 Impressively increase in rate-over-range of ~+100% at short range, ~+50% at mid range and ~+25% at long range.Bointec CPE802A consumes less power in every operation mode – active TX, active RX, idle associated and sleep than other Atheros previous chipsets. It keeps the notebook and other computing platforms running much longer on a single battery-charge, while providing TCP throughput of more than 200 Mbps when used in 2x2 mode. 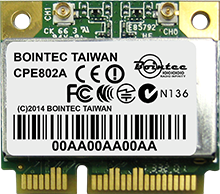 Bointec CPE802A is also optimized for Atheros Direct Connect™ P2P applications.With its Fast Channel Switch (FCS) feature, the channel switching time between the 2.4 GHz bands is reduced from 10 ms to as little as 1 ms.